France: Oh la la ! 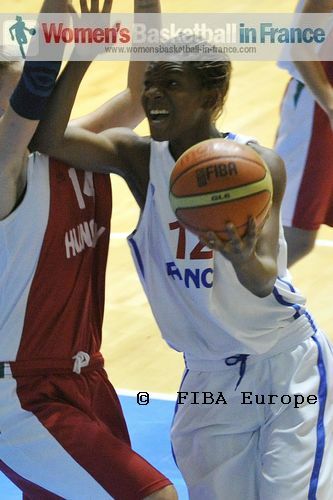 For France the decision day came early at the U16 FIBA Europe European championship for Women Division A. They needed to beat Hungary to be assured a place in the quarter-final. Serbia made it three wins from three in the relegation group by beating Finland (66-56). Once again Sanja Mandic came up with big numbers. 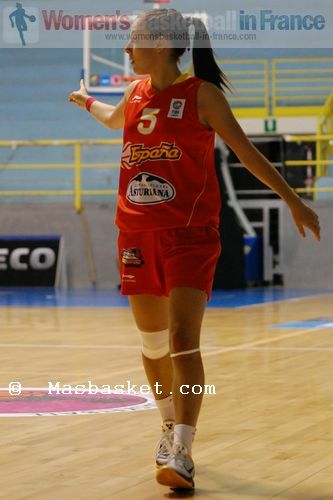 She she scored 34 points, had 10 rebounds, 5 assists and 5 blocks. However it was her 14 points and 2 assists in the final quarter that enabled her side to win the game. Croatia pulled off the escape of the day. Trailing by 15 points to Poland going into the final quarter they ended up winning (72-69). Finland's stay in the FIBA Europe elite at U16 level can only be saved if they start winning. A defeat against Croatia in their next game means relegation for the Wolves. 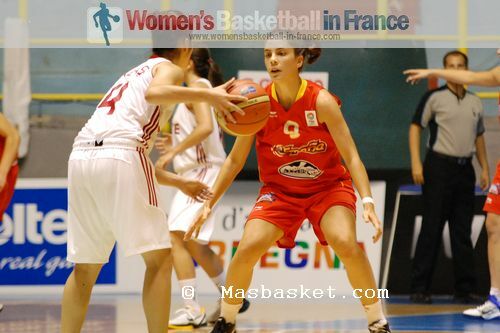 You may read the stories of interest by selecting the link below on the news from the final day of action from the qualifying round of the 2011 FIBA Europe U16 European Championship for Women Division A.
Hungary needed to beat France by a big margin to stand a chance of qualifying. So they played aggressively from the start scoring 13 uncontested points in the opening 4 1/2 minutes. The Hungarian players then got a little carried away and started to miss. On the other side France had woken up and with Bétengere Dinga-Mbomi (left) and Assistan Koné sharing 7 points the match finally took off. Hungary regained the momentum to lead (17-9) with a minute to play in the first quarter. France stopped throwing the ball in the middle and ran with the ball which resulted in Fleur Devilliers scoring from open play. 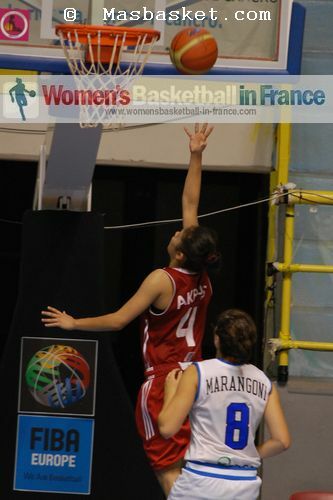 Alexia Lacaule was drawing a shooting foul for two free throws for a 4-0 finish of the first quarter (13-17). France continued after the break hitting 4-from-5 shots in an opening 8-0 run to conclude the 12-0 blitz over the two quarters to go into the lead (21-17) with 13 minutes played. 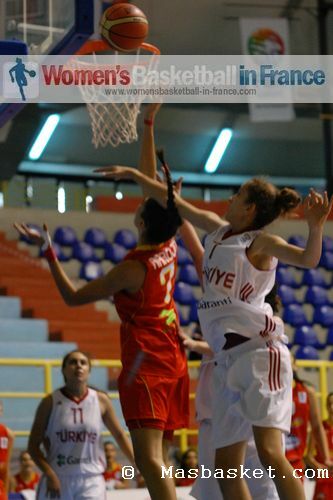 Hungary collapsed totally and France took full advantage as they went into the locker room with a 13-point lead (33-20). It would be nice to say that France controlled the game all the way to the finish but this was not the case. France have some really good athletic players who have the ability to jump high so they had the advantage on the boards. Yet the Hungarians read the plays better. So in the end the game was intriguing and exciting even if the free throwing and shooting was off at times. 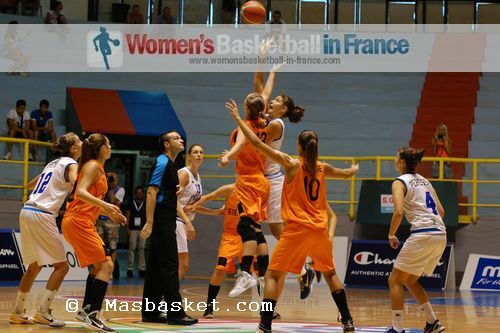 France went into the final quarter with a lead of just 8 points (45-39). They stayed ahead by at least 6 points all through the last quarter. Hungary's chance of qualifying had disappeared even if they beat France. However they did not give up and gave the French coach something to think about as money-time approached. France were lucky as Aby Gaye (in picture) was having a good game. Her 4 points during the final two minutes gave France the cushion they needed. 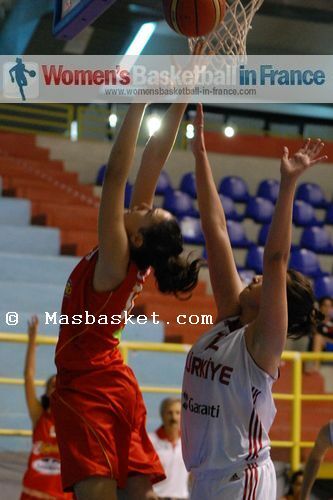 Dóra Nagy's buzzer beater trey did not change that much as France won (59-54). As expected Mousdandy Djaldi-Tabdi's injury prevented her from playing in this match. 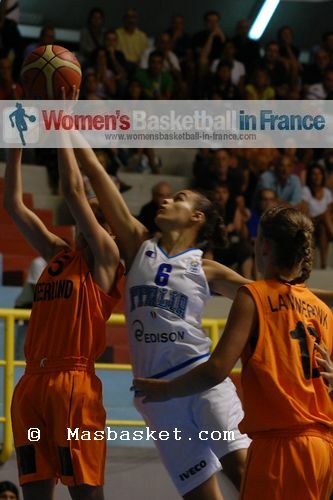 The Netherlands beat Italy (57-52) in the final group but are still out of the race for the title due to their defeat to France in the preliminary round. The Netherlands put Italy on the back foot early in the first quarter with a three-point shooting blitz. Klaziena Guijt hit three times while Laura Cornelius (left) connected once as they went on a 14-0 run. The Netherlands finished the first quarter leading (25-11) and stayed in front all the way till the end. The Italians made it a 1-point game (50-51) with four minutes to play. However 5 points by Merlin Lammerink put the Dutch back in charge. Guijt led the scoring with 18 points while Lammerink scored 14 points and picked up 8 rebounds. Cornelius finished with 8 points and 2 assists. 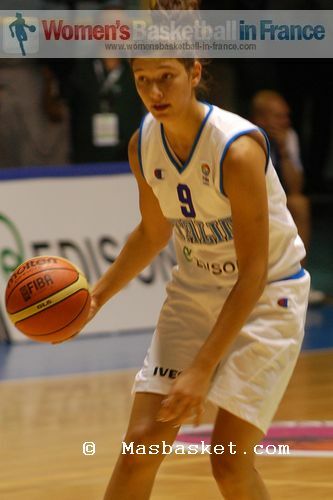 For Italy Cecilia Zandalasini was the leading scorer with 18 points while Anna Djedjemel was the only other player in double digits with 12 points. Spain were back to their dominating best as they crushed Turkey (83-35) with all 12 players scoring. It was not perfect basketball with 24 turnovers. But then it was difficult to concentrate with a (44-16) advantage at the interval. However with 16 assists and 17 steals and with nobody playing less than 12 minutes and more than 25 minutes it was a total team effort. The top four from this group in finishing order are: Spain, Italy, Turkey, France. Greece had beaten the Czech Republic on the opening day. So all they needed to do was beat the Slovak Republic to qualify for the FIBA Europe U16 European Championship quarter-final. 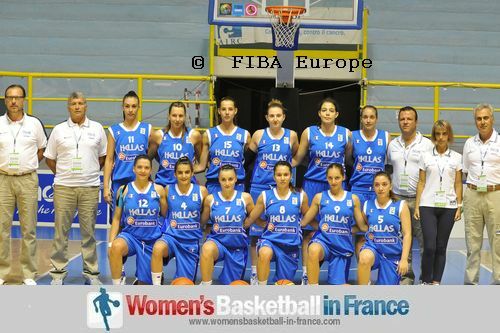 On the other side the Slovak Republic could also qualify provided that they win against Greece by a big margin. So the scene was set for an extraordinary match which was won by Greece (76-69). 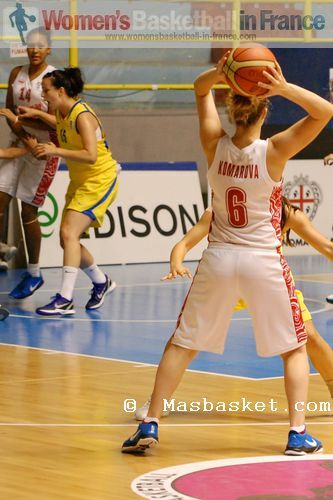 For Greece Anna Stamolamprou (left) fired in 31 points while for the Slovak Republic Zofia Hruscáková scored 32 points. It was a game that neither side really controlled during the first 29 minutes (54-54). Greece got a lucky break with an AND-1 call for Dimitra Tsavou for her side to take the lead. This sparked her team into a late flurry of scoring to close the quarter leading (60-54). The Slovak Republic failed in making up the deficit during the final quarter despite 12 points coming from Hruscáková. With two minutes left to play the Slovak Republic coach knew that his side could not qualify and withdrew Hruscáková from the game. Belgium beat the Czech Republic (75-59) behind a strong second-half performance. The Czech Republic went into the locker room with a slender lead (37-36) but then fell apart. Hind Ben Abdelkader continues to lead Belgium offensively with 22 points but received a lot of help from An-Katrien Nauwelaers with 15 points. While Belgium was defeating the Czech Republic, Russia beat Sweden (62-56), a result that sends Belgium to the top of the group. Russia never really allowed Sweden a chance in the game and went into the final quarter (56-38) in front. Sweden went on a scoring spree in the final quarter with Regan Magarity (right) doing most of the damage. But Russia always appeared to have control. 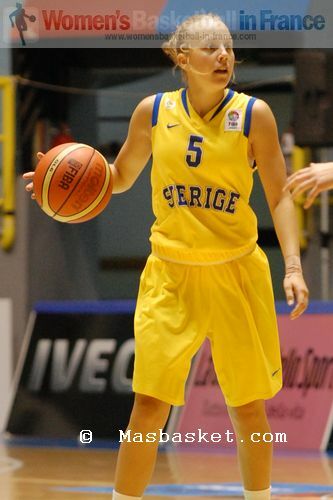 Ekaterina Tsukanova led the Russians with 17 points while Magarity scored 17 points and collected 11 rebounds for Sweden. The winners of the quarter-final matches automatically qualify for the 2012 U17 World Championships.